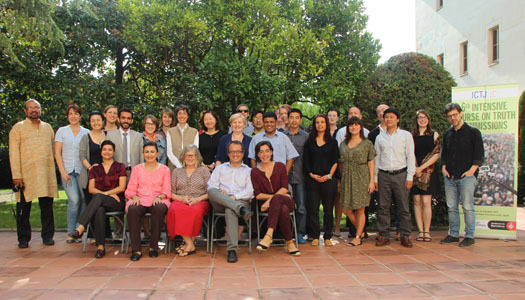 Transitional justice practitioners and activists from 18 different countries gathered in Barcelona to attend the 6th Intensive Course on Truth Commissions, organized by the ICTJ and the Barcelona International Peace Resource Center on September 29 - October 3. The course provided expert training on the design and implementation of a truth commission. This year, the course specifically focused on the intersections between truth commissions and peace processes. Participants from Tunisia, Colombia, Nepal, and other countries embarking on the creation of a truth commission –or considering the possibility of establishing one in the near future– learned about the experiences of South Africa, Peru, East Timor, and other contexts through the first-hand accounts of ICTJ instructors. This year, ICTJ’s President David Tolbert joined the Barcelona course for the first time. Together with González, Tolbert opened the training with a conversation on the challenges truth-seeking mechanisms face when they emerge from a negotiated peace process, and how important it is to carefully analyze the local context to ensure the success of such mechanisms. During his time in Barcelona, Tolbert held a public talk tackling on the Spanish case and the unaddressed legacy of the crimes of the civil war and Franco’s dictatorship. At the event, organized by Memorial Democràtic, Tolbert stressed that “it is clear that the victims and society at large have seen a very limited amount of truth, justice, or reparations in response to abuses of the Civil War and the dictatorship periods that followed.” He also offered recommendations on measures to be undertaken by the Spanish institutions, such as exhuming mass graves, providing reparations for all victims, and opening the archives. As every year, the course’s biggest asset was the array of participants involved in human rights, mediation, peacebuilding, rule of law, and transitional justice in their countries. Below we present a selection of portraits of some of them, and the admirable work they do. armed conflict, never to be found again. He is now working on an oral history project, recording the stories of the victims and broadcasting them on the radio. “The State is not matching the families’ needs and priorities. I realized we needed to speak for ourselves and lead the process as the principal stakeholders,” he said. Between 1996 and 2006, approximately 1,300 people were forcibly disappeared in Nepal. Their families are still waiting for justice. As a human rights and anti-Apartheid activist, Shirley Gunn has worked to demystify the legacy of the Truth and Reconciliation of South Africa (TRC) for years. “As an instrument from conflict to peace the TRC was very important, but we could have done better,” she argued. Internationally, South Africa’s TRC is regarded as a model achievement. It has been praised for bringing about reconciliation; however, few prosecutions were conducted, and victims are still waiting for the reparations recommended by the TRC to be implemented. “There’s still a skewed perception, even if we’ve been so vocal about our criticism,” she adds. At the 6th Intensive Course on Truth Commissions in Barcelona, Gunn shared her vision from the South African experience with participants from 17 other countries. “I’m very happy to share our experience with people from countries that are thinking about creating a truth commission-- to talk about the potential pitfalls, and how to jump over them,” she said. To learn more about the intersections between truth commissions and peace processes, read ICTJ and Kofi Annan Foundation's publication "Challenging the Conventional: Can Truth Commissions Strengthen Peace Processes?"